Vanessa Holroyd regularly performs as principal flute with the Orchestra of Emmanuel Music and enjoys an active freelance career in the Boston area with a focus on chamber music. 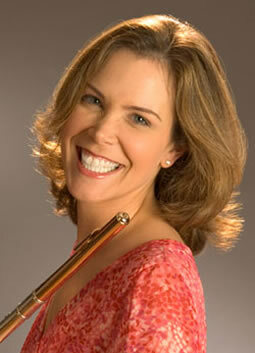 Early in her professional career, she was a top prizewinner for the National Flute Association’s 2002 Young Artist Competition including the award for the “Best Performance of a Newly Commissioned Work.” Recent collaborations include the premier of Matthew AuCoin’s opera, “Crossing” with the American Repertory Theater and members of the Grammy-nominated string ensemble, A Far Cry. She has performed on chamber music concerts presented by the Rockport Chamber Music Festival, Emmanuel Music, Steinert & Sons, and Winsor Music in addition to recitals throughout the US and British Virgin Islands with pianist, Joy Cline Phinney. Vanessa is a member of Arcadian Winds, the Boston-based woodwind quintet specializing in contemporary music and recipient of Chamber Music America’s “Residency Partnership Grant.” With the quintet and other ensembles, Vanessa has premiered numerous works and collaborated on recording projects for Centaur, PARMA, BMOP, and ECS Publishing. She has performed and taught as a guest faculty artist at the Apple Hill Center for Chamber Music since 2007 and is on the faculty of the Boston Youth Orchestra and Phillips Exeter Academy where she serves as Concert Series Manager and Tour Director. An experienced booking agent, Vanessa also co-owns and operates, Music Management Inc. (musicmanage.com). She holds a B.A. in Literature from Yale University, a M.Mus. in Flute Performance from McGill University, and an Artist Diploma from the Longy School of Music of Bard College. Her teachers include Geralyn Coticone, Robert Willoughby, Timothy Hutchins, Michael Parloff, and Elssa Green. Vanessa resides in Boston with her husband, two children, and aging shih tzu.